ABOVE: Vincent Craig, shown in a undated photo submitted by his family, says he is doing well and that he is in good spirits as he undergoes treatment for a Gastro Intestinal Stromal Tumor. BELOW: Craig's legendary comic strip, Muttonman. Vincent Craig wants the public to know that he is fine and doing well. 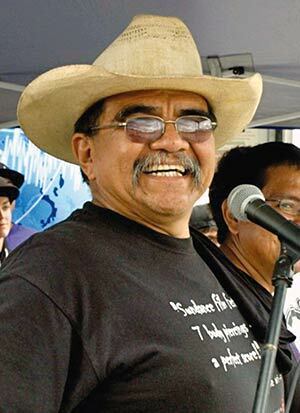 The multi-talented Navajo entertainer - comedian, singer, songwriter, actor and creator of the "Mutton Man" comic hero - was recently the subject of a cell phone text message saying that he had died. Diné performer Vincent Craig is currently undergoing cancer treatment at Banner Baywood Medical Center in Mesa, Ariz.
Friends and fans who would like to help with travel and other expenses can go to any Wells Fargo Bank and make a donation to: Wells Fargo Bank, Vincent Craig Donation Fund, Account No. 6734185546. But like another beloved comedian before him - Mark Twain - rumors of his death were greatly exaggerated. That said, Craig confirmed this week that he is undergoing treatment for a gastrointestinal stromal tumor, or GIST, a cancer of the digestive tract. His tumor was diagnosed in December. "The good thing about it is, it's treatable," Craig said. "There's a special treatment for it and it doesn't involve any radiation. It's chemo (therapy) and we're very pleased with that." Last month he spent two weeks in a Phoenix hospital where he began treatment and then moved to the Whiteriver Indian Hospital. "Soon the tumor will be taken out so the surgery is still coming up," he said March 19. As of Saturday, March 20, Craig was transferred to Banner Baywood Hospital in Mesa, Ariz., where the surgery will be performed. His last public appearance before starting treatment was Feb. 6 at the Tohono O'odham Tribal Fair. He noted that the treatment will continue in phases and that so far the process is going well. Craig, 59, expressed dismay that the erroneous message and reached - and upset - so many of his fans. "The shock was quite dramatic for some and the ones that I worried most about were the elders ... the people that had no means or access to the Internet," he said. Craig is originally from Crownpoint and lived in Church Rock and Wingate, N.M., before settling in Whiskey Valley, Ariz. He is Tl'—g’ (Zia Clan), born for Bit'ahnii (Folded Arms Clan). His chei is Tses Tlahnii (Against the Cold Clan) and his n‡l’ is T‡chii'nii (Red Running into Water Clan). On April 21, he and his wife Mariddie will celebrate 35 years of marriage. They have three sons: Dustinn, 35, Nephi, 30, and Shiloh, 25. They also raised Kyra Little Flower Johnson, 19, and have five grandchildren. News of Craig's illness triggered an outpouring of affection from admirers. When he transferred from the hospital in Phoenix to the one in Whiteriver, he found vehicles lining the highway near the hospital entrance, filled with fans and friends who honked and cheered to welcome him home. Supportive signs and more honking cars hailed his return to his residence in Whiteriver. "That was really nice of them to do that," he said. "It's true that the heart of any person comes from the community and families they come from. That is a part of their identity, who they are and where they come from." Craig, the son of Navajo Code Talker Bob Craig, often expresses that sentiment to his audiences. He also has been shaped by his experiences living among the people of the Fort Apache Indian Reservation, his wife's people. "I've been an in-law here for 35 years," he said. "I've had some honorable callings from the people. I started out initially as a police officer then a commissioner justice for the tribe, along with several other different things like court administrator." He credits his wife and the home he found in Whiskey Valley for spawning his comic creativity. "She's my muse," he said. "She makes me write a lot of things. No one has ever moved me like that." Mariddie Craig said that, in addition to the support from friends and neighbors, news of Vincent's illness has brought the couple back in contact with friends scattered throughout the world. "With all that's been going on we've been able to contact some friends that we haven't heard or seen in years," she said. "Once we had a call from India. A friend of ours had called from India because of the text message. "We've had people call from Alaska. I mean, the word traveled fast," she said. To ensure correct information is spread, the family has a new Facebook page that son Dustinn oversees. "Since the Facebook page was created, (Vincent) hit over 3,000 fans," Mariddie noted. Vincent said, "Because of the people's concern, I was up there in the top 10 most-searched in Google." "I am feeling really blessed with those that are supporting us out there," Mariddie said. "I know that someone is watching us from up above. I'm so grateful for the gesture and kindness that those people have extended to us. "I think of the impact Vincent has made often," she said. "It's very endearing for me in what I believe - faith. There are a lot of faithful and humble people out there." Craig is one of the most beloved public figures on the Navajo Nation, where to many, he's an uncle, brother, father, son, nephew and grandpa. This is what people have told his family. "I think that's what been articulated to my wife all the time," he said. "I have a great affinity for my rez people. It's wonderful. Every time I do these shows somewhere it's a very uplifting feeling." His illness hasn't kept him from writing music or conjuring up story ideas for his classic boarding-school survivor, Mutton Man. "I had the chance to work on some new material," he said. "I've got a whole new plate of songs, enough for a volume 7 and volume 8. I've also got an audio book written about a Vietnam veteran. It's just a matter getting time to record. I'm hoping to have that out by July 4." If all goes well with the cancer treatment, Craig said he hopes to be on his feet performing again by mid-April.